Among the numerous unusual businesses that have flourished in North Manchester in the past was a company that manufactured artificial fishing baits (called lures by the practitioners of the art). The lure was designed to catch the common bass, much sought by fishermen throughout the country. Like the mythical "better mouse trap" a better bass plug should be a hot item in bait shops everywhere. And the North Manchester bass bait seemed to make it to the top of the list for awhile. wood painted with bright colors to imitate various natural food items of the bass. The fishing line was attached at the wide end of the bait and three sets of treble hooks were inserted along the sides and end. The hooks were of a unique patented design that would rotate freely in a complete 360 degree circle. This was supposed to prevent the fish from twisting itself free from the hook. But now, back to the beginning of this interesting story! 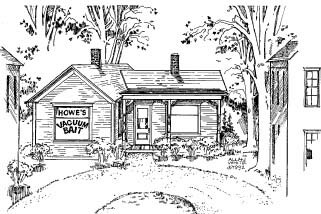 The inventor of the Vacuum Bait was Francis O. Howe, commonly known as Frank. He was born in Ohio in 1874 and came with his family to North Manchester in 1889. His father was David N. Howe who was the founder of the North Manchester College which was later called simply Manchester College. Frank would have been fifteen years old at the time of the move and had several brothers and sisters. Frank's mother died here and his father later married two more times and had a total of twenty children. Frank married in 1895 and remained in North Manchester after the Howes moved away that same year. One of Frank's children was Bruce Howe, a very colorful character in North Manchester society for many years. Among other things, Frank Howe was a musician, performing and teaching instrumental music, especially piano and violin. He was associated with Manchester College as a music instructor, at least during 1899-1900. He was a protégé of Maude Quivey, outstanding musician of the community. At the memorial service, one of his brothers said, "Some men are builders of steel; others are strong on finance; some love the gift of speech; but here was a man whose soul was touched by music, the language of the soul." many of these baits for his own use and for his friends, and eventually started to sell them. The North Manchester Journal for May 13, 1909, declares that Frank O Howe "...has spent more time in scientific fishing than any other man in this part of the country in the past few years. He has studied the habits of the fish, and when he became interested in the bait question he spent his time trying various baits, and finding the weak places and how to remedy them. The result is Howe's Vacuum Bait..."
operated by Charles Olinger. Outgrowing that location, Olinger, in partnership with Warvel, went to a new location and soon moved into the automotive business. The building housing the new factory was a frame house located just east of the Lutheran Church and near the river, somewhat behind another building in what is now the town parking lot. Dr. L. Z. Bunker recalled this quite well. Her father was a fisherman and used the bait and Dr. Bunker herself had fished some and had used the bait on occasion. In a phone conversation with the writer on November 4, 1991, Dr. Bunker described the bait with uncanny accuracy shape, color, general texture of the surface, etc. While I was talking with her, I had in front of me one of the Howe baits. She knew just the main color pattern, i.e., which was with red marks. She described the red markings as if you took a comma and straightened it out. She described the factory as "an old house, white, with a porch, located back of the Filling Station, a restaurant located toward the west side of what is not the parking lot and market." The restaurant was subsequently operated by Paul Hathaway and named the Flamingo Grill. A Mr. J. J. Martin operated a photographic studio in this complex of buildings. The house/factory could be reached by a rambling walk around the west end of the restaurant. With guidance from Dr. Bunker, Mr. Allan White, an artist and designer from North Manchester, created a drawing of the Vacuum Bait factory. For a while, at least, wood blanks were made by the Caswell-Runyan company in Huntington, a factory that made cedar chests. They would have an abundance of scrap cedar wood from which to make the bodies for the Vacuum Baits. It appears that the fabrication of the special hooks was done in the Manchester factory. Fred Horne, an outstanding tool maker of North Manchester, installed machinery (probably a multiple automatic screw machine) in the new factory. It is not known where the tin boxes that enclosed the baits were made. versions of the bait but also gave hints and instructions for using it. Some ads contained testimonies. "In about 2 hours casting with your bait I landed 7 black bass, combined weight 22 lbs." "It is the King of all surface Lures." "Was out May 21st, used four kinds and no strikes, put on a Vacuum and caught 10. I consider them a first class Bait." "On June 22nd, caught by actual count 50, largest 7 one-half lbs." William E. Billings, writing about North Manchester Industries, said, "Many fishermen swore by it, and possibly some swore at it. Tom Peabody, who always believed in efficiency, brought a bait back one Monday morning with the complaint that only two hooks were working, as he could never catch more than two fish at a time." Eventually, though, the business folded. Perhaps Olinger and Warvel felt they could make more money in the automotive business. Maybe Frank Howe's health even then was beginning to fail. In about 1920, Howe sold his patent and a quantity of unused parts for making the baits to the South Bend Bait Company. It was first advertised in their 1921 catalog and may have been listed up into the 1940s. The South Bend version differed slightly from the Howe version. For one thing, the South Bend company put eyes in their plugs. South Bend also used a more simple hook attachment with the hook swinging only in one plane. They continued almost the same color patterns in both the large and small sizes. One can always identify a Vacuum Bait; nothing else looks even remotely like it. But they are scarce today. There is always a ready buyer if one becomes available. The containers (both tin and cardboard) are even more rare. For North Manchester, the Vacuum Bait company ranks right in there along with the DeWitt Automobile, the Blackmore cigars, the bonnet company, the instant water heater company, the folding bathtub company, and other quaint and unusual products manufactured in our town. The Kenapocomoco was the Indian name for Eel River. Written by Michael McCafferty, Indiana University, Bloomington and used by permission of the author. This article first appeared in the Newsletter of the Wabash River Heritage Corridor Commission - L'Esprit de Ouabache. recording if one ignores the -n- that did not exist in the native term. La Salle never visited the Wabash; he learned of its existence from local Indians. But, after having spent three additional years among Miami-Illinois-speaking Indians along the Kankakee and Illinois rivers, he revised his early spelling to Ouabaché, the form that appeared in 1684 on a map he helped design in Paris with the assistance of the royal mapmaker Jean-Baptiste Louis Franquelin. Later French writers, who like most Frenchmen in the 18th century, were lackadaisical about using accent marks, simply wrote the hydronym Ouabache, even though they always pronounced the name with a final vowel. Even so, it is precisely because they often failed to write accent marks that we today pronounce the river's name "Wabash" rather than "Wabashee", a spelling and pronunciation that was still common in English in the 1700's. After La Salle's time in the Illinois Country, the Miami-Illinois name that is the origin of "Wabash" showed up in the writings of late 17th and early 18th century Jesuit missionaries to the Illinois Indians. Later, it appeared in the recordings done by late 19th century linguists of Miami-Illinois language. In Miami-Illinois, the form of this place-name is waapaahshiiki siipiiwi. Siipiiwi is the word for 'river'. Waapaahshiiki is a verb meaning 'it shines white'. The components of this term are waap-'white, -aahshii- 'shine' and -ki, the third-person inanimate intransitive conjunct verbal suffix whose closest equivalent in English is "it". Verb-based place-names are very common in the Algonquian languages. This hydronym, which best translates to English "White Shining River", refers to the originally bright white limestone bed of the upper river between Huntington and Carroll counties. What is particularly curious about this river's Miami-Illinois name is that it referred to a water course much greater in length than today's Wabash River. In the minds of the Miami-Illinois-speaking people and from the French point of view right up to the time that the French lost control of North America to the Britons in the 1760s, waapaahshiiki siipiiwi, Ouabaché, bracketed a waterway that combined our modern Wabash River and the lower Ohio River right on down to the Mississippi. From their point of view, the Ohio River ended at the confluence of today's Wabash and Ohio rivers. Ephemera can be described as those items that are usually discarded after brief use. Many are printed materials of some sort, often advertising items or business materials such as catalogs, receipts, sales slips, etc. Other items include calendars, envelopes and stationery, yardsticks, fans, can openers, pencils etc., with the name of the business printed on them. The variety is almost unlimited. Such items provide an interesting window to look into North Manchester businesses. The museum already has some of these items which have been donated over the years. On the surface, these items seem worthless and they do not normally have any monetary value. But since people usually throw them away, these items are quite scarce. Photos of town businesses are also wanted. Bring any such items to monthly meetings, or give them directly to Phil Orpurt, the museum curator, or to any of the officers of the Society. Items can be mailed to the Historical Society at P. O, Box 361. There have already been several efforts to document North Manchester businesses. (See the recent issue of the Newsletter). Sometime we can prepare an exhibit in the new museum of artifacts pertaining to North Manchester commercial and/or professional enterprises and eventually a more complete history of all businesses can be written.